MUFF WIGGLER :: View topic - how far can you push the blacet psu? how far can you push the blacet psu? i just sold a bunch of my frac rig and would like to sell one of my power supplies. i'm hoping to sell one and power my whole rig off of one psu. i did the math, and it would be close to a 600 ma load on my power supply. i know blacet states it's conservatively related, but would that be pushing it too far? i think i read somewhere on the forum that 550 ma wouldn't be a stretch. i have no hard evidence to go on other than recommendations, but if it were me i wouldn't want to push it that far. it could be a fire hazard and safety first!!! does anyone know how to ACTUALLY MEASURE the current draw from a PSU? i.e. where do i stick my probes, and how to i set/read my DMM? I ran 3 rows, prob close to, or just over, 600ma off 1 PS-500... it worked, I didn't feel good about it tho & wouldn't want to do it for long. Get an 800ma/Rail PSU, it'll be much happier, your modules will be much happier & you can sell both your Blacets. I ran 2.5 racks of Frac from one Blacet PSU when I was first getting started. I added an STG YU Gate Delay and it wouldn't function in its full range when starved of power. Try it out, and if you notice starvation malfunctions you know you are over the limit. I picked up one of these bad boys on Sunday at Menards and my two racks of frac that are supposed to be pushing 500ma based on Blacet's max current draw, don't go over the 300ma mark even at high patching on all available modules. This thing, in Amp mode, only gives you a reading the first number of your ma (3=3xx) - but that being said, I am waaaaaay lower than I thought I was. repeat: where do you stick your probes? 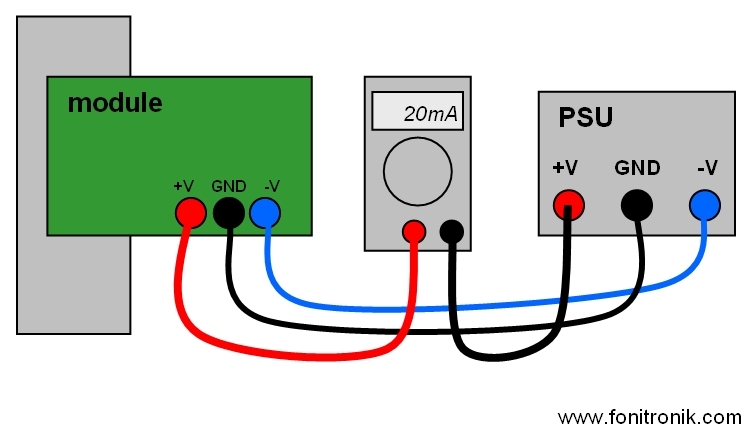 You want to stick your multimeter in series with the PSU output powerline. Def. attach it with the power OFF! - disconnect the +ve cable from PSU to rack/distro. - attach one probe to PSU +v and then the other probe to the rack. - switch ON and observe current draw. Do the same again for the -ve side. If you put this between the PSU and the wall - this tells you how much power the PSU is drawing from the wall. if the PSU is only drawing 300 ma from the wall, which is what the modules are "requesting", how could the PSU be delivering more than that to the modules? also, i believe the draw will increase or decrease based on what you've got patched up. Ideally, the Power for primary (power inlet) and secondary (to local regulators) will be identical but in practice a transformer will lose some due to not running at 100% efficiency. Lets take 75% efficiency as an example. 75% of 12watt gives 9watts the other side. The difference of Input current vs Output current is due to the different voltages at primary and secondary. i think i might do that. the hex zone is the main problem. without it, i'd be well under 500 ma. Well - this thread has gotten me thoroughly concerned enough to email JB himself and ask about my specific power drawing. John has told me that the Blacet PS500 will work just fine supplying up to 550ma. This is exactly why I love this place!